Laggard - What Does It Mean? What is the definition of a "laggard" as it applies to the stock market? What makes a stock a "laggard"? The dictionary defines a laggard as "one that hangs back or falls behind". Let's look at an example of a "laggard". Let's take the homebuilding sector. Let's say that there are 20 publicly traded companies in the homebuilding sector. After a particularly strong earnings report from one of the largest homebuilding companies, the entire sector moves higher (almost). Of the 20 companies in the sector, 19 are green (positive) and one is red (negative) after the earnings report. In this case, the "red" stock would be the laggard. This stock is lagging behind the rest of the companies in the sector. The reason is usually specific to the company. Maybe they lost a key contract to the big company that reported strong earnings. Maybe they are currently dealing with management issues. Maybe their earnings are eroding in an increasingly competitive environment. 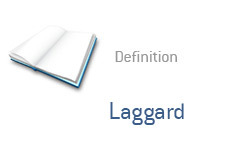 This is the most common usage of the world "laggard" as it applies to the stock market.